I warm to anyone who shares the view that Saltaire is an inspirational place in which to live and work. Thirty-two year old Nick is a gallery assistant and bookseller at Salts Mill, who is immersed in this special Saltaire ambience day after day. I feel that Nick is an artist who has only recently discovered his own unique style. After experimenting with graphic techniques for many years, he’s maturing into a very accomplished artist. The theme for his latest Project is the story of Titus Salt’s journey from the Victorian Hell of Bradford to Elysian Saltaire– a series of pen and ink images, using his distinctive cross hatching method. Mouse over images to enlarge. You can see his work at Magic Number Three at 2, Victoria Road, where the first 2 pictures in his “Saltaire” series are on sale as limited edition (50 only) fine quality prints. They are proving to be very popular. Nick is working on the third in the series right now. Magic Number Three already has advance orders for this unfinished picture! Popular or what!! His aim is to produce 12 to 15 pictures showing Titus’s journey and the creation of his Mill and Village. The first images are black and white, with dark clouds and black shadows. But he intends to introduce bright colour into his prints as Saltaire is entered. Nick is a local lad, born and raised at Carr Lane, Windhill. His bedroom window overlooked the Aire valley, and he lived with a view of Salts Mill throughout his childhood. Education was at Nab Wood Grammar, and then on to a graphic design course at Bradford. 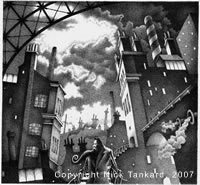 He was drawn towards illustrating children’s books, and did a Higher National qualification at Middlesborough. Magic Number Three staff have confidence in Nick’s talent, and so do I. If the sales record is to be believed, so do you! Here is an artist with a very bright future ahead.